The early ski season in Vermont before the first heavy snowfalls is typically limited to a couple of strips of man-made snow groomed and re-groomed on a few short, narrow trails. Since tons of skiers are itching to get out on snow, these first few weeks of early season skiing see these short narrow strips of snow (“WROD “– White Ribbons of Death) resemble skiing on crowded, tilted sidewalks of Manhattan...except everyone is careening wildly around the trails with sketchy, rusty skills (us included) trying to get their ya-yas out with sometimes brand-new, untried equipment while staying off the dirt and rocks on the sides of the trails...meaning it resembles a pinball machine filled with skiers trying not to run into each other on waaaay too few square meters of snow surface. In short, you need to make very quick, often emergency-mode directional changes frequently (depending on the density of traffic that particular run). This is where Vin’s UpSlope shined at its remarkable agility to change direction with confident authority, despite its 105mm waist often being forced into some somewhat firm man-made surfaces. The same quick, responsive agility showed up on the Spring-like corn snow surface we skied on some days in November. Get the UpSlopes “in” snow, they display a round, controlled, surprisingly quick turn behavior without feeling hooky or darty….just smooth, crisp arcs of different radii on demand without much effort. The key is the ease with which you can maneuver the UpSlopes and put them where you want them without washout, protest, uncertainty or anxiety. The UpSlopes have a huge fun-factor and essentially have a sweet spot along their entire length with excellent energy. You don’t have to muscle them or be in a constant state of vigilance while piloting Vin’s skis. You see where you want to go, point them, ride them, repeat...all while a grin slowly grows on your face. The UpSlopes control unwanted vibrations and buzz underfoot through three layers of VDS rubber strips sandwiching the edges and sidewalls really, really well. 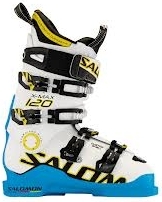 They have a snappy, responsive, playful feel with a masterful confidence on edge across surface types, without demanding athletic input from the skier. The relatively long, lowrise tip rocker and shaping produces a ski that skis shorter than it measures since the effective edge on snow is less than you imagine (our test ski was 179cm...order a little longer than you would normally...trust us). While we expected the shape and camber of the UpSlope to perform nicely off-piste, what shocked us (not just surprised us, but actually shocked us) was how well the 105mm-waisted ski performed at cut-and-thrust antics in tight, crowded trail conditions with manufactured snow surfaces. The WhiteRoom UpSlopes reset our reference standard for how nimble and quickly-grippy a ski this size can be. Cosmetically beautiful, artistically crafted topsheet veneer marquetry with multi-species strips of wood along the entire length. Glossy epoxy sealant. Fit and finish are excellent, mating surfaces are very well finished. Edges are not 360-degree wrap. Very well tuned and waxed right out of the box. No detuning or adjustments needed in our opinion (some may want a little tip detune below the rocker departure point for less immediate engagement on-edge...we liked it as-is). Medium-to-soft flex with rounded transitions tip-to-tail with moderate snap response. Torsionally compliant but pretty stout feeling twist resistance tip and tail. Tail notches for climbing skins. Really handsome looking. We felt guilty putting them into a rooftop ski box with other skis...worried about scratching them...that’s how nice they look. Obviously a hand-crafted labor of love. The WhiteRoom UpSlopes were delivered with a progressively-beveled, professional tune and man, it showed what Vin’s shaping can do on firm surfaces. We can only recall one or two other skis this size (137-105-122) over the years with such impressive security on packed snow. When you ski the East, you will find hardpacked, windblown, sometimes icy conditions on and off-piste, so Vin knows people need secure edge grip underfoot and along the entire length of the ski and he delivered it in spades. Turn initiation begins in the forebody with a tipping of the chassis and slight pressure...that’s all it takes. You don’t need to muscle the ski into a flexed arc or transfer weight forward and down at all...just tip it and apply slight pressure and the front of the ski grips, bends the midbody under your weight into the surface, then you decide if you want to ride it all the way along the tail to the end of the ski, or release the pressure and roll over into a flat ski or opposite turn in the same manner. For such a relatively large-bodied ski, the UpSlopes have a really nice carving behavior some narrower skis wish they had. Vibrations on hardpack surfaces are essentially neutralized, thanks to the generous layers of VDS rubber cradling the edges and dissipating the energy, so you never get any buzzing or nervous oscillations at speed. This is an Eastern-bred ski with serious hardpack skills seldom found in similarly-sized skis. Vin’s gradual nose taper and gentle rockered rise creates some really well controlled, yet responsive handling traits in mixed-surface conditions (as much as we could find in November in Vermont before any significant natural snow storms). The skis traverse chopped-up surfaces with various types of snow smoothly and with confidence. They don’t deflect, don’t drift, don’t get knocked around and never seem to complain. They track where you point them, essentially absorbing and ignoring the snow and undulations along the way, yet you can pop in and out of compression and release modes to give yourself a choice of snappy, fun and responsive play with sometimes surprising agility and quickness, or a quiet, gentle ride...all without burning your energy reserves getting the ski to behave the way you want it to. “Broad spectrum fun” is the way to describe the UpSlopes in mixed conditions.